There is nothing better on a lazy morning than cooking with your loved ones. Everyone is in their pajamas and heading to the kitchen. Sounds a little “Norman Rockwell,” but what the heck? Dishes that have many options are always the best when you are faced with different tastes and palates. Crepes happen to fit the bill on that count. Lacy looking thin pancakes can be filled with a wide array of ingredients. Sweet and savory alike work well. Think of it this way: crepes are a canvas to color as you desire. I also have a few thoughts for last minute gifts for the foodie in your life. With less than a week to shop, I like everyone else, have a couple of ideas for you too. 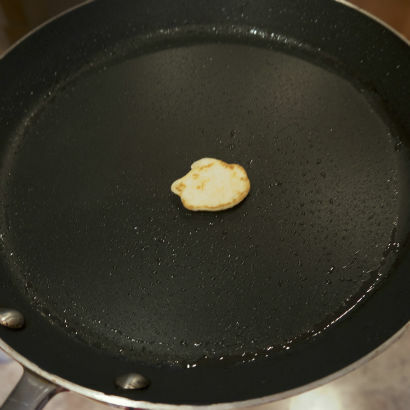 Starting with a crepe pan. You can find them on line at Amazon and at almost every cooking store. Prices range from $20 to $200. All you really need is a good non-stick pan and most skillets will work, but the nice thing about a crepe pan is the shallow edge. 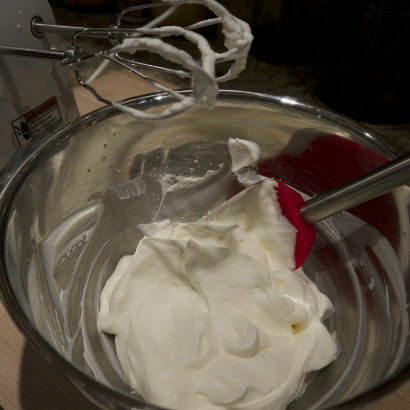 Crepe batter is incredibly easy to make. 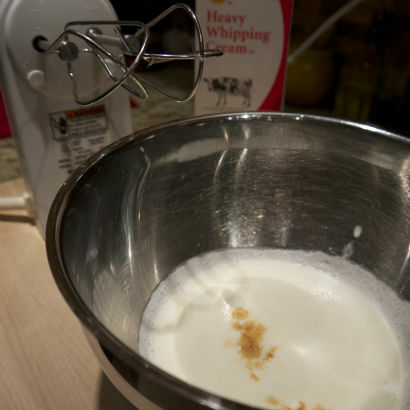 Simply add all your ingredients to a blender, combine and then let it rest. Resting the batter is important, otherwise you will have rubbery pancakes and that is not good eats! 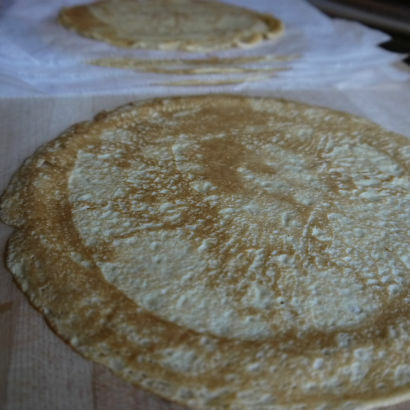 My go-to crepe recipe is one that Alton Brown had on his show nearly 10 years ago. It’s still the best one in my book. I should note that on his recipe it says that it will make 17 crepes. 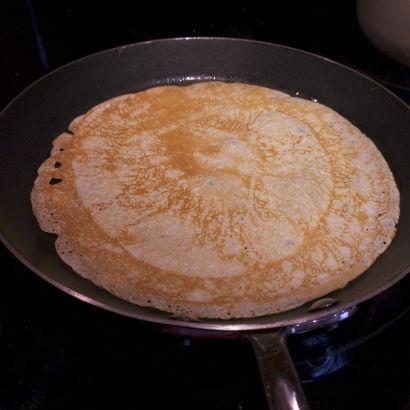 I have done this recipe countless times and get 8 – 8″ crepes, using a 1/4 cup measure in a 9″ pan. and adds a nice smoky dimension, not to mention how they look! Now that I had the base ingredient for my crepe I wanted to add a little something else. Consulting my Flavor Bible inspired me to consider blueberries. The Flavor Bible is another great foodie gift. It reads like a dictionary, with ingredients listed in alphabetical order. It’s literally the one book that never gets placed back on the shelf in my house. I probably pick it up once or twice a week when I am cooking something new. While your crepe batter is resting in the ‘fridge you, and your extra hands, can busy yourself with the rest of fillings. The blueberry sauce is just a matter of getting it on a back burner to cook down and thicken a little. Fresh blueberries will work too, I just happen to keep a bag of nice big bag of organic ones in the freezer for smoothies. to getting a perfect consistency. Whipping aside, you don’t need to add any extra sweetness to this dish. The bananas and blueberries will provide enough. Just about the time you have the components ready you can make your crepes. 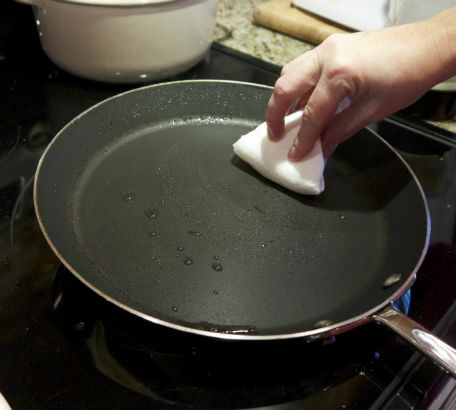 Do a little test first to make sure your pan is hot enough. No sense in loosing any batter to a pasty looking first crepe! My other tip would be to remind you to add a little canola oil in-between each crepe. Use a paper towel to spread it around. This step will ensure that all of your crepes have a pretty lacy look to them. 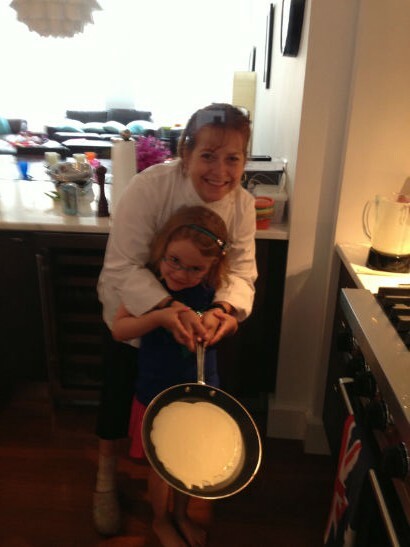 Making crepes can be a really fun thing to do with kids. It’s a highly requested dish for my cooking classes. With little people you can give them the sense of doing it by holding the pan and swirling. 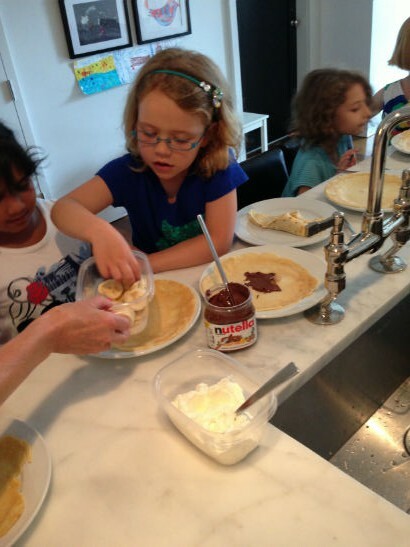 Make sure you have a little nutella on hand, it’s the most requested crepe filling for 9 out of 1o kids. 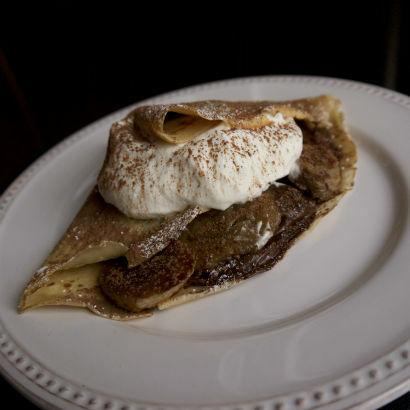 The grown-up version: Caramelized Banana and Nutella Crepe. 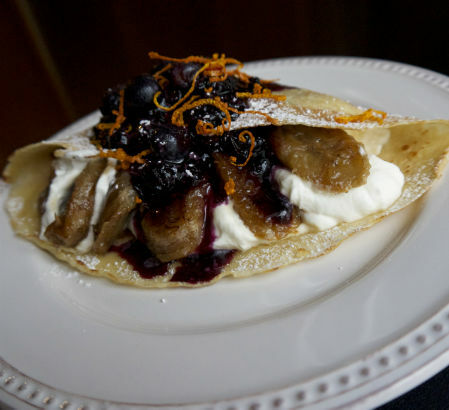 The finished dish: Caramelized Banana and Blueberry Crepes. All in under an hour with a few hands to help you. 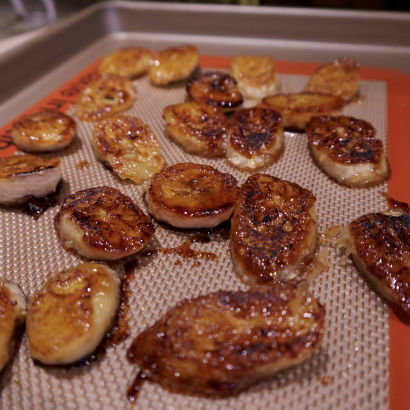 If you want to save a little time make the batter the night before and while you are making the crepes you can have the fillings cooking at the same time. 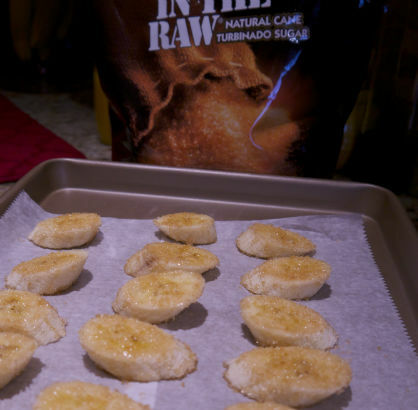 Click the link to see the recipe. Enjoy the holiday and cooking with your family. Buon Natale!